This pullover is knit from the top down starting with a ribbed neckline and has modified raglan shaping so that the sleeves almost look like set-in sleeves instead of raglan. 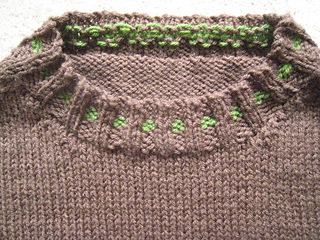 Short rows help form the neckline after the ribbing. There is no seaming. It is shaped slightly at the waist. 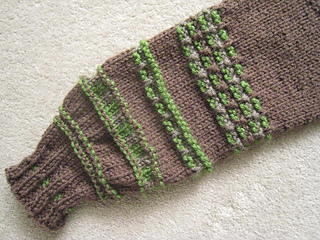 It may look as if stranded knitting was used. However, only one color was used in any given rnd. Designs are achieved by slipping sts (and the occasional purls).